Is electromobility poised to take us beyond the internal-combustion marine engine? Volvo Penta thinks so. And sooner than you think. 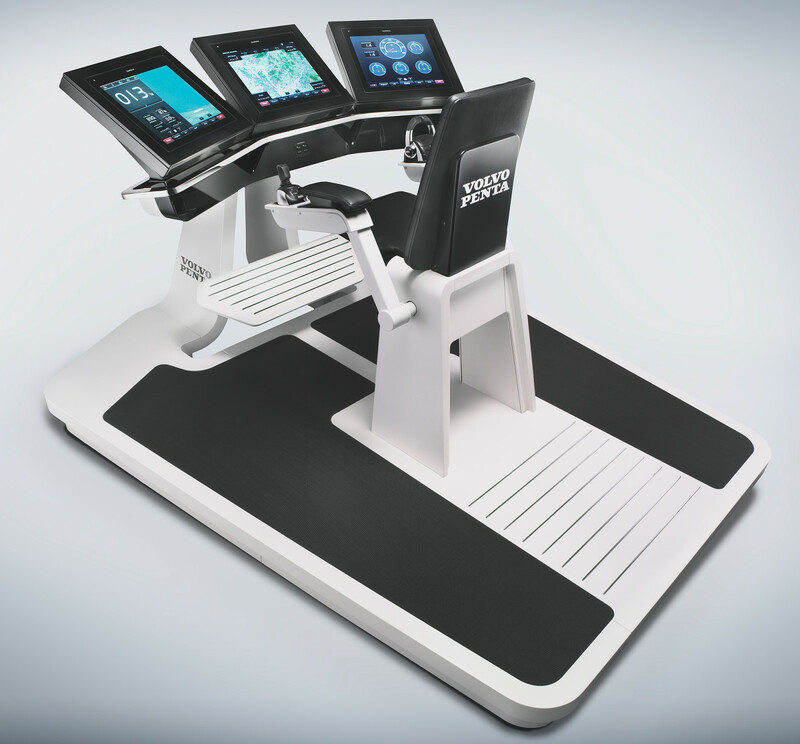 Volvo’s helm of the future would “ergonomically optimize” all e-mobile systems. 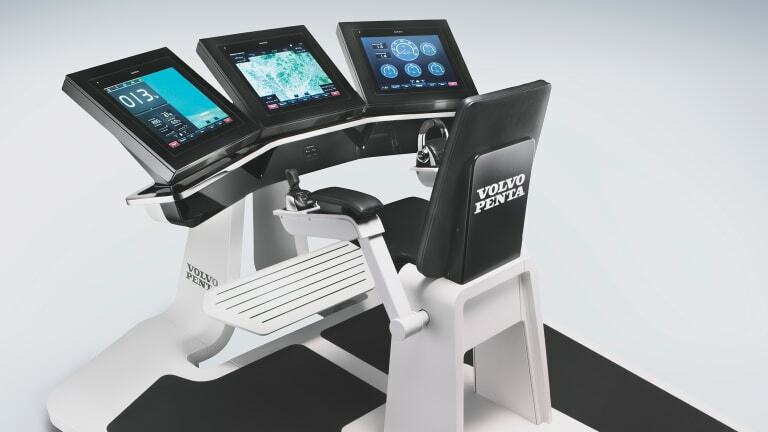 During the summer of 2017, by way of announcing its recent purchase of outboard manufacturer Seven Marine, Volvo Penta held an extraordinary marine press conference. By this I mean the thing didn’t take place in a boat-show booth, with a cadre of marine journalists looking on. Or in a high-rise conference room hired for a special roll-out, complete with a rubber-chicken dinner. Instead, it occurred telephonically. On the line were the Volvo Penta brass in both Gothenburg, Sweden, and Chesapeake, Virginia; the Seven Marine honchos in Germantown, Wisconsin; and us—the journalists—dialing in from all over the world to listen in and ask questions. It was an out-of-the-box deal, as far as I was concerned, and unlike any other press conference I’d ever attended. But then, historically, Volvo Penta has always been an envelope-pushing outfit. 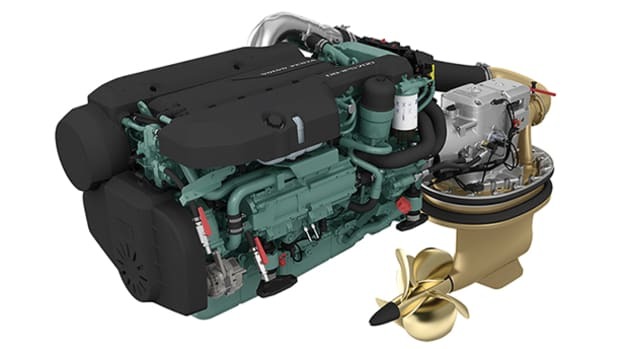 It put the first stern drive on the market back in the late 50s, introduced the Duoprop’s contra-rotating propellers to the recreational marine scene in the early 80s and, just a decade ago, was first up with pod propulsion. Top, a schematic rendering of the IPS-hybrid system shows how compact the electric motor/generator (shown below minus shroud) will be. 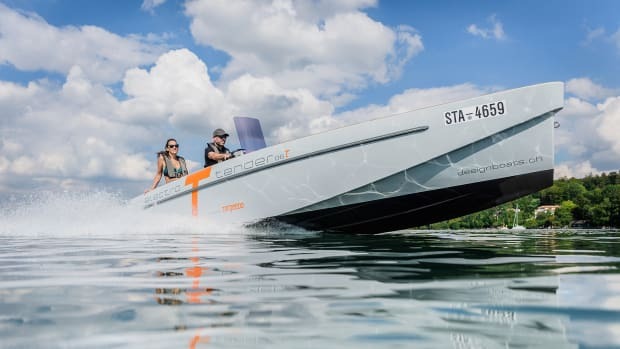 At any rate, figuring I’d get little more than a Swedish guffaw, I nevertheless asked Bjorn Ingemanson, President and CEO of Volvo Penta, if the boating public should expect a high-powered electric outboard from Volvo Penta any time soon. The shock I received from Ingemanson’s response was (pun intended) flat-out electric. The months that followed proved interesting. 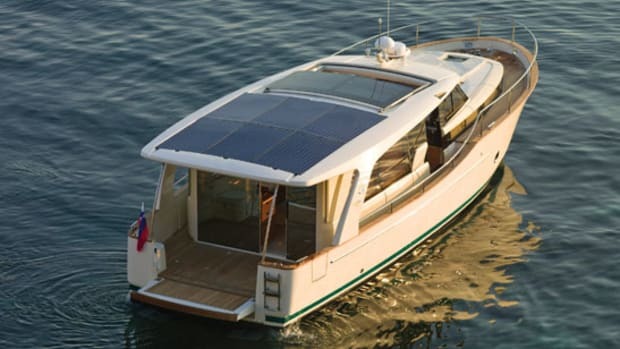 At boat shows and other marinized shindigs around the country, I continued to hear tantalizing tidbits concerning Volvo’s up-and-coming electromobility or -“e-mobility” program, although I couldn’t get a soul to say anything on the record. And some of the stuff was pretty wild. One guy contended that Volvo Penta, an internal combustion maven for more than a century, was going “all electric” within the decade. Wasn’t Volvo Cars making the switch in 2019, he argued. And weren’t Volvo Cars, Volvo Group and its subsidiary Volvo Penta all owned by (or at least affiliated with) Geeley, a Chinese multinational on track to electrify 90 percent of its automotive fleet by 2020? 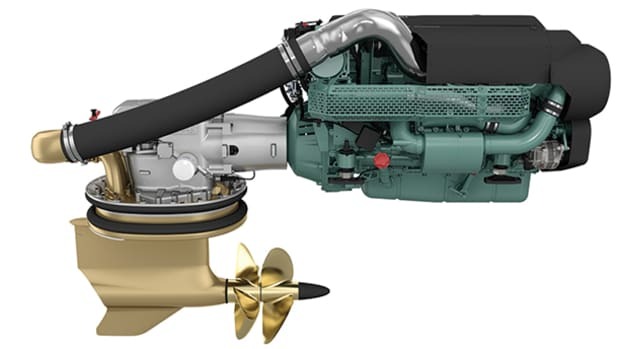 Then there was another guy who contended that Volvo Penta would soon add skunkworks capabilities to the Seven Marine facility in Wisconsin, so Volvo could develop (on the QT) a stable of brand-new, super-quiet, super-efficient electric outboards. Just wait, he advised. Understandably, curiosity got the best of me. I contacted Volvo Penta, requested an interview with Senior Vice President and Chief Technical Officer Johan Inden concerning all things electric, and eventually found myself flying off to Sweden, a country that produces much of its electrical power via renewable resources. The latter fact was strongly emphasized by the number of huge, modern windmills I saw from above as my plane approached Gothenburg, the home of Volvo Penta’s corporate headquarters. There were literally thousands of them. Inden and I sat down together one afternoon in one of the outbuildings at Volvo Penta’s picturesque test facility on the edge of the Gothenburg Archipelago, an immense collection of rocky, forested, mostly automobile-free islands where bicycles, boats, electric cars and ferries are the standard means of transportation. We’d both just arrived from a small, select and quite conventional press conference in Gothenburg proper. There, Volvo Penta president Ingemanson, Inden and a couple of other Volvo principals had made two significant announcements. 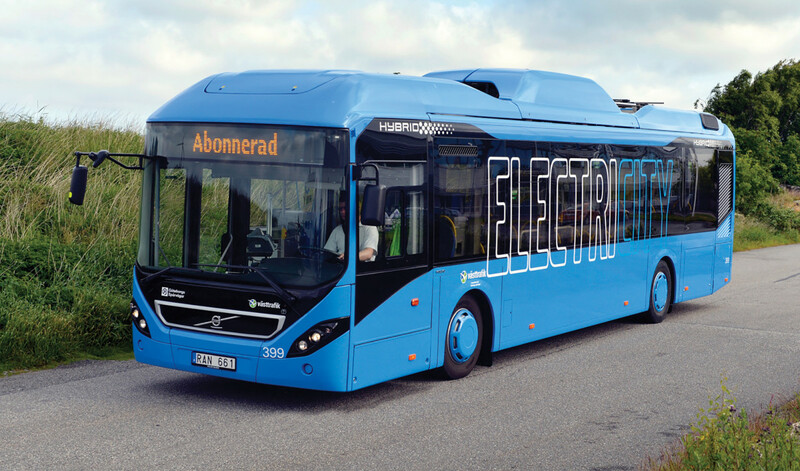 Volvo has over 6,000 electric buses in service worldwide. The first was a hoot. 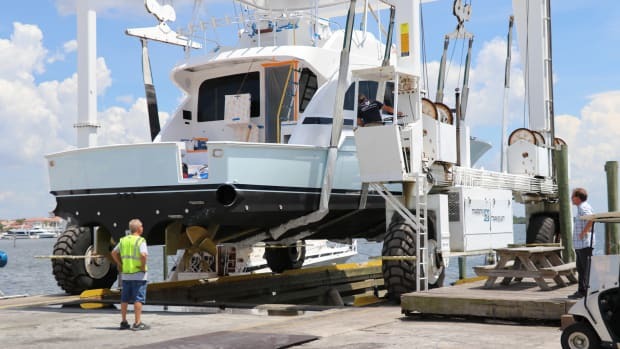 It zeroed in on Volvo’s first self-docking yacht, a 68-foot Azimut (see “A Boat That Thinks on page 192”) that had just transported us to the test facility. The second had wider-ranging implications perhaps. It heralded Volvo’s first major foray into the field of marine e-mobility. 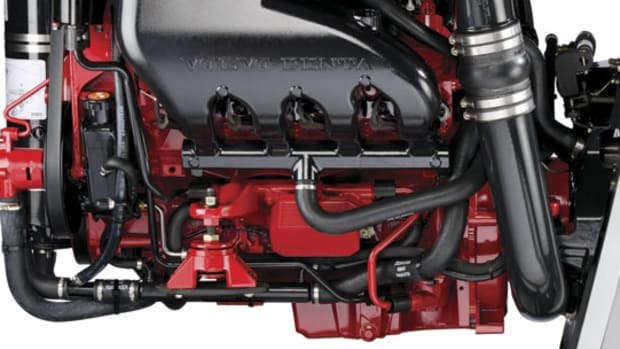 An IPS-powered electric-hybrid vessel (with twin Volvo Penta diesels in the 8- to 13-liter range) was scheduled to launch in 2021. 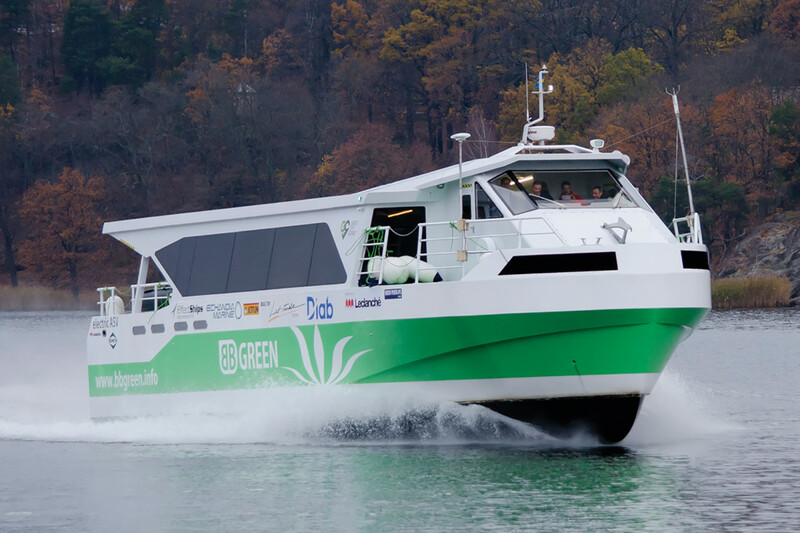 Right from the get-go, it was obvious that Inden sees hybrid propulsion as the true game changer—the first major step by a major engine company into a future where both commercial and recreational vessels will be environmentally cleaner, more efficient, quieter, smoother, easier to use and more attuned to specific applications than they are today. However, when I asked him how many years he thinks it will be before marine hybrids and all-electric drivelines gain a significant share of the marine market, he was a tad vague. Such technologies have one thing in common, according to Inden: predictable usage patterns. It’s no coincidence, he pointed out, that buses were the first form of electromobility that Volvo put on the market. Buses, after all, operate within highly predictable parameters, running the same routes daily and making the same stops where equipment can facilitate charging. On the marine front, passenger ferries, water taxis and tour boats are similar—running times are predictably bus-like and so are charging logistics. So, numerous electric vessels of the type are already on the water today. Volvo’s also involved in high-profile electric ferry projects in Europe. Volvo’s been doing R&D work on land-based e-mobility for several years and, in fact, already has an e-mobility development and test lab in Gothenburg. Moreover, less than 10 years ago, Volvo Group stopped building and selling buses powered by diesel engines exclusively and made the switch to electric. Today the company has over 6,000 hybrid and full-electric buses on city streets worldwide. 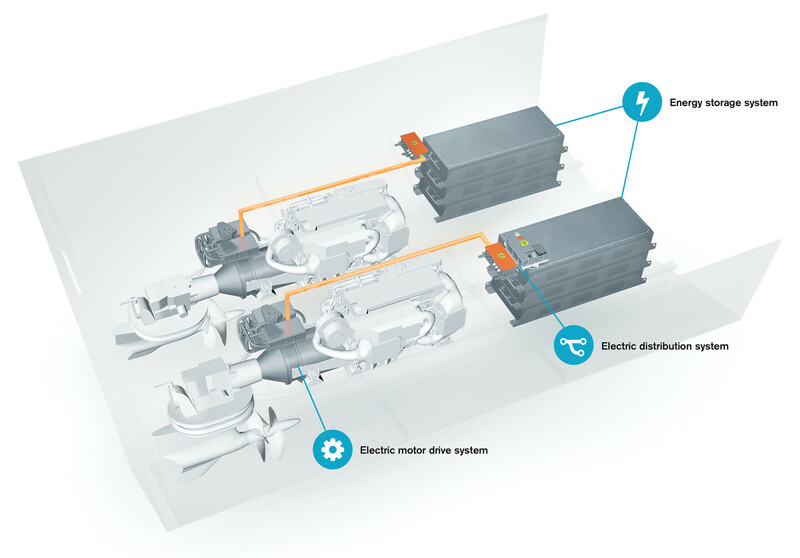 These details, seemingly unrelated to the development of a hybrid-electric yacht, are nevertheless quite germane for one major reason—Volvo is using its highly successful and fully vetted hybrid-electric bus technology to develop the IPS-powered hybrid it will launch in 2021. While one hybrid version will be marinized and the other not, the drive trains (except for transmissions), Lithium-ion battery packs and many other components will be more or less the same. The IPS-hybrid system itself is of the parallel type, meaning diesel and electric power can be employed simultaneously as well as separately. 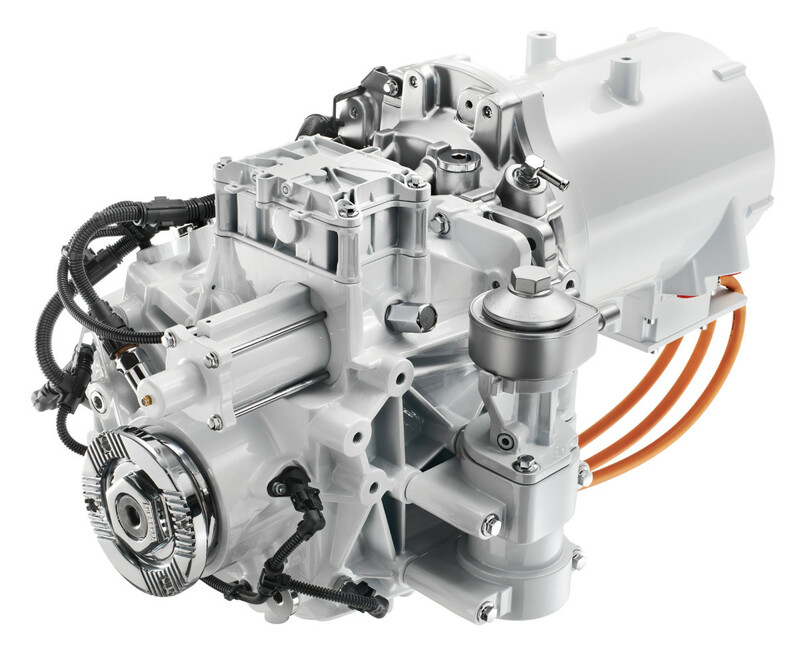 To achieve this, a clutch and an electric motor/generator (with an inverter controlling both the motor’s torque and speed through a 600-volt DC bus system) are compactly spliced into the drive train between the diesel engine and the IPS pod. Lithium-ion battery packs supply juice to the motor (and for hotel loads) and can be charged either by the prime mover or via a remote AC or DC charger. An electrical distribution system routes electrical exchanges amongst the battery packs, the motor and other peripheral components. How does the system actually work? 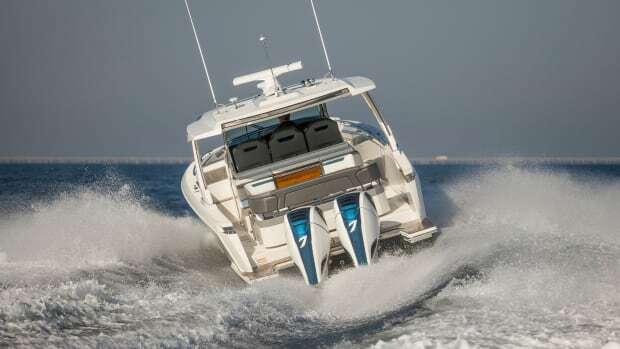 When you disengage the clutch, the boat runs exclusively in the full-electric mode while achieving top speeds, according to Volvo, in the 10- to 12-knot range. Engaging the clutch puts both diesel and electric power into the propulsion system. Of course, the virtues of a hybrid powerplant are numerous. First of all, in full-electric mode a hybrid is essentially emission-free, generally quieter than an internal-combustion engine and less prone to vibration. And then, while maneuvering dockside, boat handling torque tends to be more robust and instantaneous with full-electric power. And finally, there’s the battery customization thing—the size and number of battery packs can be tailored to the purposes of a given vessel. Where a great deal of electrical power may be required, say, for continual or long excursions through environmentally sensitive areas, add batteries. Where less electrical power is required, simply subtract. By the time I’d finished speaking with Inden, I was truly intrigued. For starters, he seemed like an eminently practical, down-to-earth guy, with a predictably conservative approach to product development, marine safety and life in general. But then, a flair for the fabulous kept coming up, often unexpectedly and with gusto. 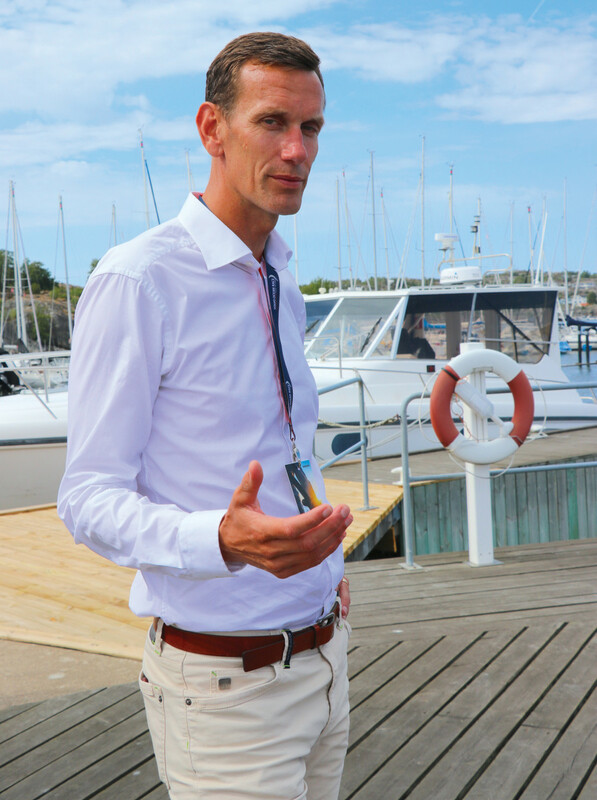 Volvo Penta’s Senior VP and Chief Technical Officer Johan Inden. The first time I picked up on this was when I posed a question about battery technology. Lithium-ion dominates the e-mobility scene these days, and I wanted to know what might be next. Might it be graphene—the space-age material that was all the rage some years ago, fizzled out but is now possibly making a comeback? While battery technology is probably e-mobility’s biggest hang-up these days, the promise inherent in the rapid pace of energy-density development he’d just described seemed to energize Inden, causing him to fervently revisit a futuristic scenario he’d briefly outlined during the press conference in Gothenburg that morning. 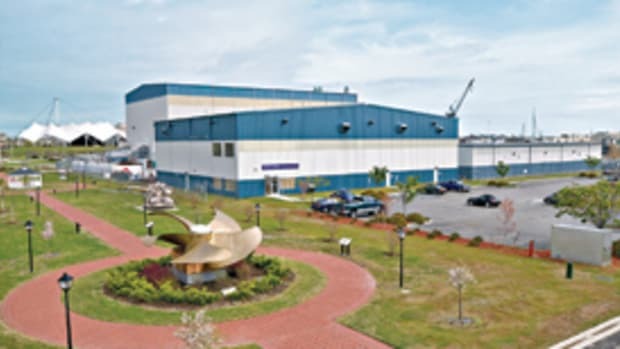 The scenario opened in a harbor city where a ship-loading facility occupies one side of the waterway (with electric cranes, electric terminal tractors, partially robotic electric truck trains and autonomously operated electric barges) and a marina occupies the other. 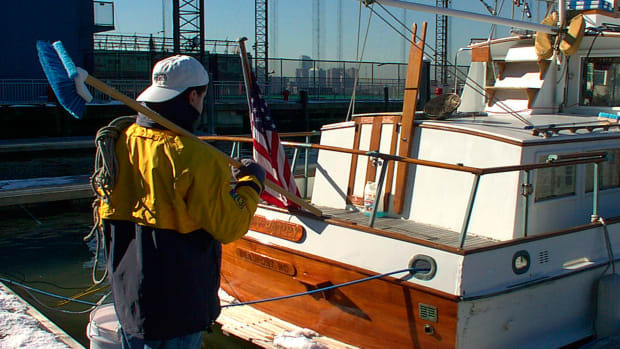 “Then I wouldn’t be surprised,” Inden continued, “that the boat can actually dispatch itself, via the self-docking option you have already witnessed today. It checks the surrounding area, travels smoothly, quietly and with no emissions over to the place where I may be getting off the bus and then away we go on our cruise. Maybe there’s an environmental or legislatively-restricted zone that we will pass through where noise, speed and emissions are prevented, but we will have no problem. “But is all this realistic?” I asked, somewhat wide-eyed. I considered these assertions for a moment, then proffered a grin of my own. Obviously, I was sitting across the table from a guy who seemed normal in many ways—a fellow who drives a normal car, lives in a normal house and cruises with his normal family on normal weekend boat trips around the Gothenburg Archipelago. But then, just as obviously, I also seemed to be sitting across the table from a prophet of sorts, in a white-startched shirt. And truth to tell, you had to seriously consider the things he was saying, not only because of his influential spot at the top of the marine biz, but because of where today’s evolving technologies are generally headed. Is Volvo Penta’s vision of boating’s future, and the part e-mobility will play in it, all that far-fetched? Inden doesn’t think so and, quite frankly, neither do I.